Cuba, Dominican Republic, Grenada, Haiti, Jamaica, Leeward Islands, Puerto Rico, Windward Islands. Located between the Atlantic Ocean and the Caribbean Sea, south of Florida and north of South and Central America. This is a political map of the Caribbean which shows the countries and islands of the Caribbean Sea along with capital cities and major cities. The map is a portion of a larger world map created by the Central Intelligence Agency using Robinson Projection. You can also view the full pan-and-zoom CIA World Map as a PDF document. Google Earth is a free program from Google that allows you to explore satellite images showing the cities and landscapes of Caribbean Islands and the rest of the world in fantastic detail. It works on your desktop computer, tablet, or mobile phone. The images in many areas are detailed enough that you can see houses, vehicles and even people on a city street. Google Earth is free and easy-to-use. The Caribbean Islands contain several of nearly 200 countries illustrated on our Blue Ocean Laminated Map of the World. This map shows a combination of political and physical features. It includes country boundaries, major cities, major mountains in shaded relief, ocean depth in blue color gradient, along with many other features. This is a great map for students, schools, offices and anywhere that a nice map of the world is needed for education, display or decor. 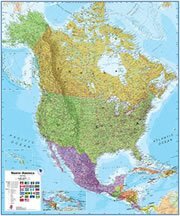 If you are interested in the Caribbean Islands and the geography of North America, our large laminated map of North America might be just what you need. It is a large political map of North America that also shows many of the continent's physical features in color or shaded relief. Major lakes, rivers, cities, roads, country boundaries, coastlines and surrounding islands are all shown on the map. 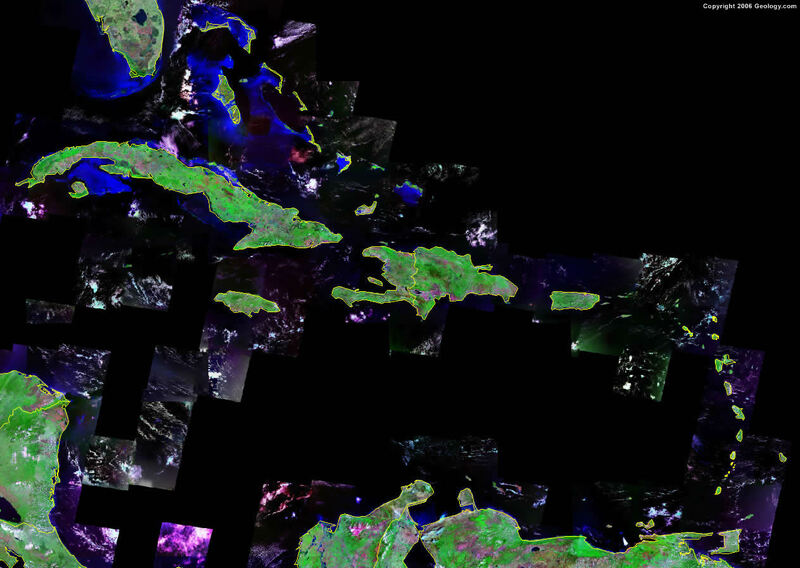 Abaco Islands, Anguilla, Antigua, Aruba, Bahamas, Barbados, Basseterre, Bimini Islands, Bonaire, Bridgetown, Castries, Curacao, Dominica, Eleuthera, Exuma, Florida Keys, Grand Bahama Island, Guadeloupe, Havana, Kingston, Kingstown, Leeward Islands, Martinique, Montserrat, Nassau, New Providence, Port au Prince, Port of Spain, Roseau, San Juan, San Salvador, Santo Domingo, St Kitts, Nevis, St. John, St Lucia, St Vincent, St. Croix, St. Geroge's, St. Thomas, Trinidad, Tobago, Virgin Gorda, and Windward Islands. Bodies of water include the Atlantic Ocean, Caribbean Sea, Gulf of Mexico, Lago Enriquillo in the Dominican Republic, Lago Maracaibo in Venezuela, Lake Okeechobee in Florida and Straits of Florida.